Quality signs that help your organization shine. We are a leader in providing high quality signage to American Legions, VFWs, Elks and Moose Lodges, and other community organizations world-wide. 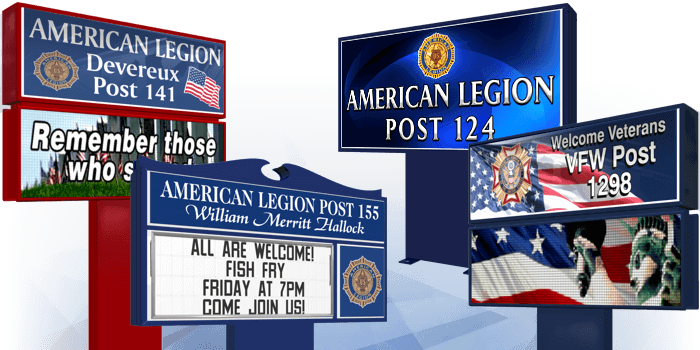 We work with national and state level organizations to ensure you the highest quality sign at the best price, and are a licensed provider for the American Legion and the VFW. A big thanks to our consultant for all of the work in helping us to select the right sign. You should see more sales from our area, the Moose Club and Fire Department have both shown interest to me. Our sales rep is wonderful, it is so nice to get the instant feeling that the voice on the phone is actually working for you and cares about your problems. Also that this person actually knows their product.